Productivity • Run Hard. Rest Well. How do I get more done? Before you let out a guttural scream, peek at the article below. I think you’ll enjoy this article by Sean Kim (March 11, 2014) as much as I did. It’s called Work to live. Don’t live to work. What was Ford’s 888 Rule? Was it a successful, strategic move? Despite the fact that numerous studies find a work week beyond 40 hours makes people less effective and productive, most refuse to believe it. Are you among the dissenters? (Parenting does not fit easily into 8 hours. Kiddos don’t have an on/off switch. How does a stay-at-home parent figure out this balance? I think it’s worth the effort to wrestle this one through, knowing there are no cookie-cutter answers.) Any thoughts on this? Which one of Sean’s 5 Rules is worth a try this week? Onward, dear friends. 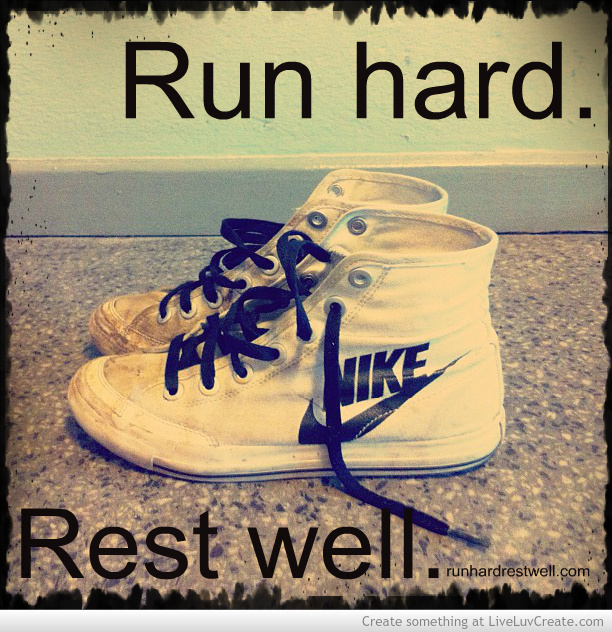 Run hard. Break a sweat. Find your focus. Then, rest well—feet up, guilt- free. I love the concept of organizing or bunching tasks. When I jump from one task to another I lose momentum. If I am doing email…I do emails…cards…I do cards…paperwork…I do paperwork. To stop in the middle of filing to call the doctor leaves both tasks underdone. It’s hard to get back to doing what I was doing. If I get to a stopping point…I stop. My big issue is the guilt of not getting everything done that I think someone else thinks should have been done. Bad, Betty! I find long-term hospital life impossible. The days are packed with people, therapies, doctors. They are full. There is little margin. nothing “gets done.” I see no accomplishment at the end of the day…except coordinating the home-front as best as I can. I really like to run. I like milestones and goals. Healing and recovery does not always have a lot of milestones. It can be a slow, slow go. We are waiting for Rehab approval for Joe. Gotta get his right leg moving! Josh is growing a little less stable right now. Making plans to get me home for awhile this weekend. Yes, my friend. You need air to breathe. The noise and the bustle all around when you cannot be involved…you have no purpose in the work going on. The noise drains me. I can’t be still and hear God. I can’t join the work and accomplish something and it’s maddening. I understand. My daughter fell apart the other day. She is 40. I wanted to “do” something to make it better…beat up someone…fix it…fight…but I couldn’t. I had to watch the defeat in her face and hear it in her voice. And my issues are nothing like yours. I understand. The pain of helplessness it so intense. What I struggle with is bad….but it’s worse on Ann. What Josh and Joe are going through is Hell…but it’s worse on you. I’m praying my friend. For air. For trees and flowers and a real shower…with real soap. I’m praying for air to breathe and a gentle breeze as God’s Spirit brushes past you and through you and in you. I’m praying that God will show you a glimpse of His plan. Oh, Brenda, I’m praying. God will provide. Jehovah Jireh. God will protect. You will not fail. You will “do” everything needed in its time. I hate the word wait. I hate it! Hate it! Hate it! And time for a real shower with real soap. Brenda, We are praying for ALL of your family. God is holding All of you in His arms. I would like to try the 90 minutes to get tasks done, then take a break and move on to something else. I already do emails, text messages, paper work, ect in groups. I even do grocery shopping that way. Its a beautiful day I hope that you can get outside and enjoy it for at least 15minutes today. Have you heard of the shampoo that doesn’t require water to wash your hair. Suave has some, I wish I was there with you because I would give you the can I have. Ethel says it’s great for those times you can’t get the much needed shower. Your prayers bless and encourage us. Let’s go for those 90 minutes !! I hadn’t heard the 888 from its source before…I LIKE IT! I appreciate Sean Kim’s thoughts here, especially the 90-minute rule. I wonder how close my body clock is to that. I discovered at work (on the computer all day) that if I will concentrate and go all in until my focus wanes, that I can get back to it better if I get up from the desk and briefly do something else. Simply changing tasks on the computer doesn’t give the same result. A physical and mental break increases my productivity. Your blog has really blessed me. I’m learning to be intentional in taking rest that refreshes me and truly allows rest – not just escape. I used to feel guilty about my time-outs. I’m trying, now, to choose more carefully those activities and places that will truly give me a break, inspire me, comfort me and energize me for the rest of life that’s waiting in the wings. Thank you for your ministry! You’ve captured the heart of rest! You paint a beautiful picture! We are running a marathon. Passionate about sustainability. You are living it. Tasting it. Sharing it out loud.